Let us first understand what a quadcopter actually is before we get into the details. A quadcopter is a multi-rotor aircraft that has four motors and four rotors and is capable of undergoing more stress compared to its counterpart of two motors. Also, the craft is more stable and agile due to the presence of four different motors. This allows the device to work better under windy conditions. We have seen the number of drone hobbyists’ increase significantly in the past few years. Also, the competition among quadcopter companies has produced a number of interesting quads and additions. As far as size goes, today there are quads ranging from the micro-sized models to relatively bigger ones. Large quads are usually used by people who treat the concept of flying as a hobby or by professionals in the genre of aerial photography. They are also used for rescue operations in case of emergency situations as well as for military and defence purposes. Their wingspan can vary from about 15 inches (380 mm) to 30 inches (760 mm). This is quite large in comparison with smaller quads. Large quadcopters come with a number of advantages and useful features. Most of the models are also capable of carrying cameras for capturing the views as seen from a height or for FPV. The camera is held steady due to the steady gimbal. This allows you to get a smooth flight and crisp pictures. Affordability: Quads are a very clever innovation. However, that does not mean everyone can afford them. To reach out to all the flying enthusiasts, the drone companies made sure that these quadcopters suit different budgets. Accessibility: Anyone can fly a quad, which means that these quadcopters are accessible. Some models work well for amateurs while some others require previous experience. New perspectives and views: You might be coming across many buildings or features regularly. However, an aerial view will give you new perspectives from a height of 100 feet (30 meters). Relaxation and fresh air: Flying is just like any other sport. It is a great way to take some time off, clear your mind and it also gives you freedom and rejuvenates the mind. Movies: Using a large quadcopter here can do you a world of good if you are interested in filmmaking. It will give you new and different angles to your sense of photography. Learning: Flying quads allows you to learn a lot about flying in general because you learn to keep in consideration the aviation aspect, GPS service, photography, the meteorology, etc. Sharing: Thanks to the connectivity of the large quads you get the chance to share the captured video feed and the photos clicked with your family and friends on social media. Flying a large quad gives you the freedom to experiment with your skills and interests but it is very important to follow the rules for flying your quads. It is very important to keep the quadcopters away from public places where they can interfere with the normal functioning. You should always keep them within your line of sight in order to not cause any harm to the public buildings or the general public. There are different types of quads currently available on the market and in this article we are classifying this amazing gadget on the basis of their sizes and what each size is used for. Toy Sized Quadcopters: We find toy sized quads quite a lot and they are more popularly called the mini quads. The propellers of these small devices are about 5 inches (127 mm) long and the wingspan is around 6 inches (150 mm) to 12 inches (300 mm). The mini quad is a lightweight aircraft and is also sturdy and resistant to some minor crashes here and there. It is also easy to control. It is important to note that the replacement parts are easily available for cheaper prices. The toy sized quadcopters are mainly used indoors by newbies and amateurs who are trying their hands at flying for the first time. Hobby Quads: This is considered to be a large quad. The propellers have lengths varying between 6 inches (150 mm) to 12 inches (300 mm) and the wingspan is about 12 inches (300 mm) to 24 inches (600 inches). These quadcopters can carry a small camera, such as GoPro Hero 3+ and they can usually fly quite far from the base point where the pilot stands. The fact that they can carry a camera opens the door to many exciting photos and video footages. However, some pilots have reported that these quadcopters tend to become too heavy with the burden of the gimbal, camera, etc. Hobby quads are perfect for those pilots who pursue flying or aerial photography as a hobby. Professional Quads: Professional quadcopters are the largest type. The propellers go as far as about 12 inches (300 mm) and they have a wingspan of about 25 inches (635 mm) to 30 inches (760 mm). Almost all of the quadcopter models under this category come with a camera or a camera gimbal. Professional quads have a solid body. This feature ensures that the camera remains steady. This also makes it easier to mount a sufficiently equipped camera. Sometimes, pro quadcopters have extra space to fit in a couple of additional gadgets. Pro quadcopters are well equipped to carry heavy cameras. This enables you to get the most crisp and stable pictures and video footages. These quads can be flown further away from the pilot and they are also able to go through a few crashes without causing much damage. Pro quadcopters are perfect are for people who are in the business of aerial photography. There are many large quad options to choose from in the market. This is the reason why we have listed out a few that are among the best in the business. Every quad has its set of pros and cons. We have introduced some of the best largest quadcopters available for sale and the one you choose will depend on your own needs and requirements. The package includes DJI Phantom 2 Vision+ Quadcopter, remote controller, 4 propellers, battery, battery charger, Micro-SD card, lens cap, gimbal clamp, prop wrench, 2 power cables, 2 plug adapters, micro USB cable, stickers, 4 vibration absorbers, anti-drop kit, 4 landing pads, spare screws, Phantom 2 Vision+ Quick Start Guide and instruction manual. 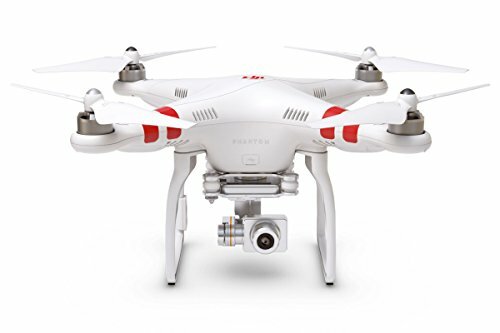 When you picture a quad in your head, you will probably picture a DJI Phantom 2 Vision+. DJI has been making the quads for years now and they have done tremendously well to satisfy the flying enthusiasts. This model is DJI’s most tricked-out deluxe edition of the quadcopter. The DJI Phantom 2 Vision+ features a 14MP camera that is stabilized and controlled with an integrated 3-axis gimbal and this feature makes this drone perfect for capturing aerial footage and photos. This large quadcopter is perfect for people engaged in aerial photography because the camera can capture 14MP and can record video in 1080p Full HD at 30 frames per second or 720p at 60 frames per second for creating slow motion effect. The quad’s 11.1V, 5200mAh Li-Po battery will get you about 25 minutes of fly time, and once your battery is dead, it takes about 100 minutes for a full reboot. The transmitter features a line-of-sight range of up to 800 meters, depending on conditions and the quad gives you the perfect FPV on a Wi-Fi connection that reaches up to 700 meters. Another useful feature of this amazing device is its integrated GPS facility that helps the quad to hover around or remain stable in autopilot mode and allows it to maintain its location. It is also important to note that upgradability and customization options are off the charts. There are a staggering amount of accessories for this quad because the Phantom is one of the more popular quadcopters on the market. 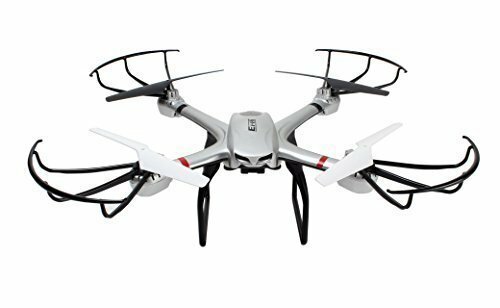 The package includes 3DR Solo Quadcopter, controller, flight battery, battery charger, battery for transmitter, the frame for GoPro camera and 1-year warranty. The 3DR Solo is perfect for those people who are looking for a large quadcopter that looks stylish and gives you a power packed flight. This large quad is designed this $800 bird specifically for capturing aerial video. It is equipped it with a range of autonomous flight modes that make it easier to shoot those smooth, professional-looking cinematic shots. The 3DR Solo is also one of the easiest quads to control and it is ideal for those who have no flying experience. The 3DR Solo features a pre-bound transmitter that has been styled after a video game controller. There are pushbutton commands on this transmitter. They give you control for both the quad and the camera. You can also take off or land at the click of a button and you can even adjust the camera mid-air to get the best angle for the photos. If you want, you can also make a pause in the middle of a flight, capture a snapshot of the surroundings. You can even record a video for viewing it later. The 3DR Solo does not come with a built-in camera. However, it is compatible with GoPro t Hero models 3, 3+ and 4.These cameras can easily be attached to the drone’s main body via a compatible stabilization gimbal. The manufacturer equipped this badboy with a powerful 5200mAh lithium ion battery that gives about 25 minutes of flight time. After that, it takes about 100 minutes to recharge each battery. The 3DR Solo is powered by two computers and it is considered to be the world’s first drone with a brain. The quad also features the Orbit feature. This feature allows the quad to keep moving in a circular track to focus on the subject. 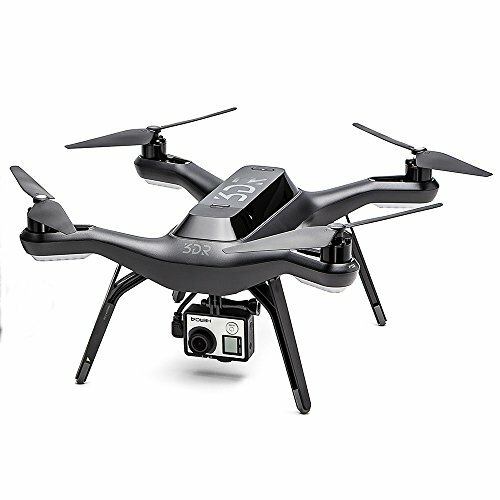 The package includes Walkera QR X350 Pro RC UFO Quadcopter, G – 2D brushless gimbal, Devo F7 transmitter, receiver, Li-Po battery, balance charger, and mushroom antenna. The Walkera X350 Pro is perfect for professionals who are sharpening their skills of flying. This RTF UAV has an altitude sensor and GPS receiver onboard. These features help you to get cleaner footage and pictures by keeping your quad stabilized. Unfortunately, the drone doesn’t come with a camera. This means that you’ll have to purchase a camera separately if you want to capture aerial video or images. When you purchase your drone you can order a compatible camera from Walkera. The Walkera X350 Pro also offers a One Key to Home feature. This feature uses the drone’s GPS to automatically land the drone and it if you are just starting out flying it will definitely come in handy. The drone also comes with a two-axis gimbal. It keeps the camera oriented and tilted in the same direction as the drone. This will definitely result with smoother video for you. You get 25 minutes of battery life with this drone thanks to a powerful 11V 5200mAh Li-Po 3S battery. The battery only takes about 60 minutes to recharge the battery. This allows you to spend less time waiting around and more time flying. It is important to note that you will be warned whenever the power in the battery is about to run out because the quad features a low voltage indicator on board. 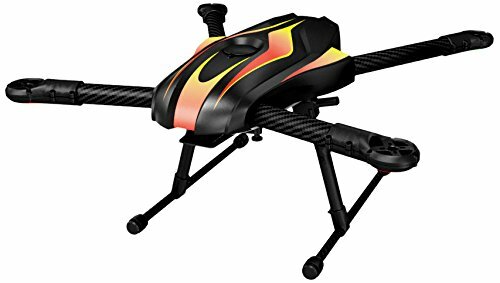 The package includes the Super Hornet X650 frame kit, retractable landing gear, four propellers, four electronic speed controllers, instruction manual, and four 340kV brushless motors. The X650 has amazing flight power and durability and it can be considered to be a professional quad. This drone comes with 2 options – frame only or ARF (Almost Ready to Fly). So this might not be the drone for you if you aren’t big on tinkering. The X650 is perfect for people who have been flying for quite some time and are in the business of professional aerial photography. This drone might be a little too expensive. However, its performance makes it worth the money. The drone features 14 inches propellers has an asymmetrical folding frame for transportation convenience. The drone comes with enlarged frame plates. They allow you to incorporate other equipment on board such as electronics, a camera gimbal, a camera, etc. Due to its carbon fiber arms this quad is extremely steady in the air. This feature makes the system a lightweight structure and easy to fly. The X650 is equipped with a powerful 6000mAh battery Li-Po 6S and has a flight time of about 18 minutes. There is also a mounted battery plate underneath the device. This ensures that the center of gravity is held stable and steady. The best thing about this quad is that is Compatible with major flight control systems and gimbals on the market. However, the manufacturer recommends the 2.4 GHz Dragon and the Morpheus H3D-360 3-axis gimbal with a mount for GoPro Heroes for the best results. Another interesting thing is that the gimbal could also be a mount for death lasers. The package includes the Ionic Stratus Drone, transmitter, battery, cable for charging, 4 protection frames, 4 rotating blades, 2 landing skids, GoPro holder, screwdriver and instruction manual. The Ionic Stratus Drone is a large quad that is equipped with a number of amazing features. Even if you’re a user with minimal experience with quads, this drone is very easy to work with. The drone’s headless mode is one of the most attractive features. This mode allows the drone to move in relation to the pilot’s position towards the drone so the headless mode is very useful, especially for beginners. The drone also features One Key Roll Button, which makes the quad roll forward once. There are three different speeds for the flight of the quad: the low speed channel, the medium speed channel and the high speed channel. The Ionic Stratus Drone comes with a nice 7.4V 1200mAh Li-Po battery that provides about 10 minutes of flight time. The battery takes about 150 minutes to charge completely. Also, the drone is capable of carrying a GoPro Hero camera. The drone is delivered with the mount that allows you to attach the camera to the front of the drone in order to get crisp images from a higher altitude. Song: Foria- Break Away: https://www.youtube.com/watch?v=UkUweq5FAcE What else do you want to see on this channel? Check me out on Instagram: jorsny. Today there are many quadcopters available on the market because more and more people are getting interested in quads for pursuing a hobby or for professional purposes. In this article we have presented 5 of the most exciting large quads currently available on the market. The DJI Phantom 2 Vision+ is perfect for those people who are interested in flying a drone and taking some crisp pictures of the sights above. One of the most exciting options in this device is definitely Headless Mode. This drone also comes with a camera and the gimbal is also stable and sturdy. These features allow you to click some really smooth pictures. The drone also has amazing flight time. The 3DR Solo Drone is ideal for those people who are entry level pilots trying to have some experience in terms of flying. Also, the efficient camera network gives you smooth and crisp pictures. However, the GPS connectivity gives the pilots a difficult time because it fails to function properly at times. The Walkera QR X350 PRO has a total aerial time of 20 to 25 minutes and this is another quad that can challenge the Phantom on this aspect. The system is easy to set up and has a very solid body and the transmitter working range is a good 3280 meters. However, this drone is not perfect for a beginner pilot. The X650 from Thunder Tiger Robotix gives a really stable and solid flight. Also, to have a good flight you would need to add the flight controller separately. This large quadcopter is perfect for the professional pilots or aerial photographers because this quadcopter might be a little expensive. The Ionic Stratus drone seems to be a good choice when we talk about the ease of flying. This quad will give you one of the most stable flights and the drone is really easy to maneuver. One attractive feature is the headless mode. This mode will give you better control of the drone and in turn, the camera focus. Also, the Ionic Stratus drone can endure small and light winds. However, it wouldn’t hold ground against stronger winds. Flying outdoors: being able to take it outdoors is definitely of the biggest advantages of flying a large quadcopter. Professional photography: You can place the heavy cameras on board without having to worry about the load because the large quads are steady and more convenient to use. Solid structure: These quads are very solid and even in windy weather the drone remains unperturbed. Because of their large size and the fact that they will disturb objects in the path, the large quads cannot be flown indoors. These large quadcopters take more time and precision to assemble.